Sakina Khanum Mosque is located in Quba city of Azerbaijan. The construction years of the mosque was between 1840 and 1854. It was built by the wife of A. Bakikhanov- a famous Azerbaijan scientist and writer to commemorate her husband after his death. Sakina Khanum Mosque is very impressive with its unique design. It is 27 meters tall construction. The main material used in construction was bricks. Even more, construction of the mosque completed without using any cement. Instead, the architect used chicken eggs as a binding element in the building. Big white metal dome covers the top of the building in the shape of a multi-faceted helmet. 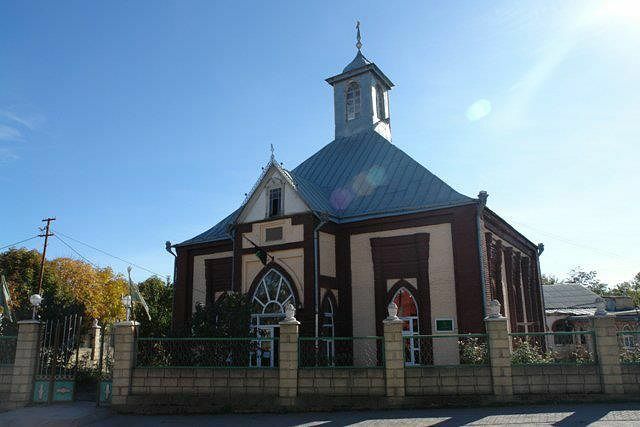 During the Soviet period, the mosque operated as a workshop. Later in 1993, Azerbaijan government restored the mosque and opened to visitors.